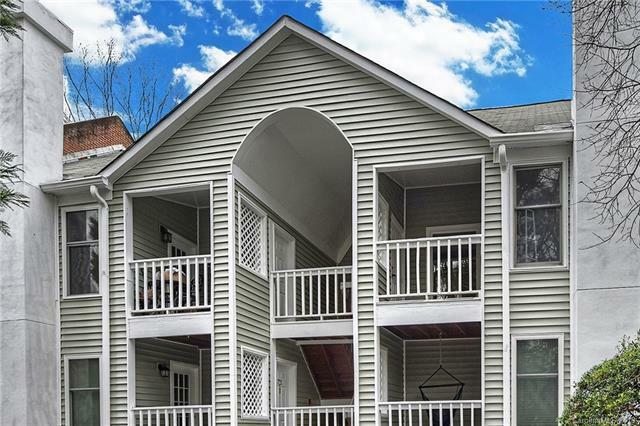 430 Queens Road #721, Charlotte, NC 28207 (#3467556) :: Caulder Realty and Land Co.
Adorable renovated 2 bed 2 bath condo in fabulous Myers Park Manor Location. A wonderful find under $200K!Renovated kitchen with stainless steel range, microwave, refrigerator, BOSCH dishwasher, granite counters, and bright white cabinets. Spacious living room w/ fireplace and dining room overlooking the private sitting porch. Renovated bathrooms have white tile floors & tub surrounds, new mirrors & faucets, and bright white vanities. Very well maintained and located in a quiet location in the community. Sit and relax on your porch overlooking the woods. Seller has ALREADY paid the confirmed special assessment for community siding replacement AND they've elected and paid for for new windows in most of the home. That's a total value of over $7000. WOW!